Storleken för denna PNG-förhandsvisning av denna SVG-fil: 640 × 320 pixlar. Andra upplösningar: 320 × 160 pixlar | 800 × 400 pixlar | 1 024 × 512 pixlar | 1 280 × 640 pixlar. Dansk: Montenegros flag (i brug den 13. juli 2004) - RGB farverne, 1:2 dimensionerne og konstruktionsdetajlerne baseret delvist på skabelonerne: Flag (Montenegros regering) og Våbenskjold (Montenegros regering). 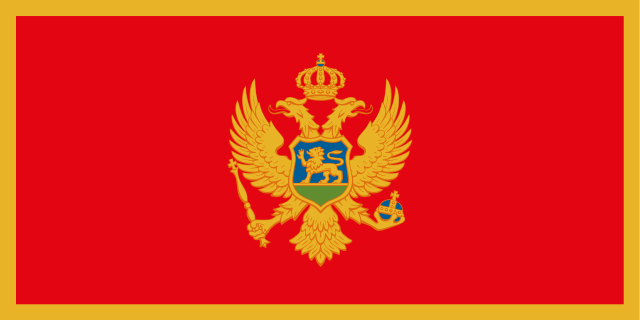 English: Flag of the Republic of Montenegro (adopted on 13 July 2004) - RGB colours, official 1:2 dimensions and construction details based partly on the templates: Flag (Government of Montenegro) and Coat of arms (Government of Montenegro). Any of acts in judgment processes." Hence it is assumed that this image has been released into public domain. A source should be included so that the status can be verified. This federal law applies for both republics, Serbia and Montenegro, as long as they do not adopt own inherent laws. 18 oktober 2010 kl. 22.01 640 × 320 (134 kbyte) Fry1989 previous version, but with the colours from version Sharakov reverted to.